I’ve tried to take some advice from my own mother and not buy things which I know Eleanor will love right now as her almost-six-month-old self. Things that will go the distance over the next year have been on my radar. Our big old chestnut tree in the backyard is crying out for a swing in the summer (once Blossom has mastered this sitting business). I’ve also tried to not go heavy on the toys – she already has so many toys from her big cousins, and like I said – is pretty entertained with a piece of paper. So other items which she ‘needs’ have been on the Santa wish list – a pram liner, a new summer weight Grobog, clothes (although she really doesn’t need more of them either! 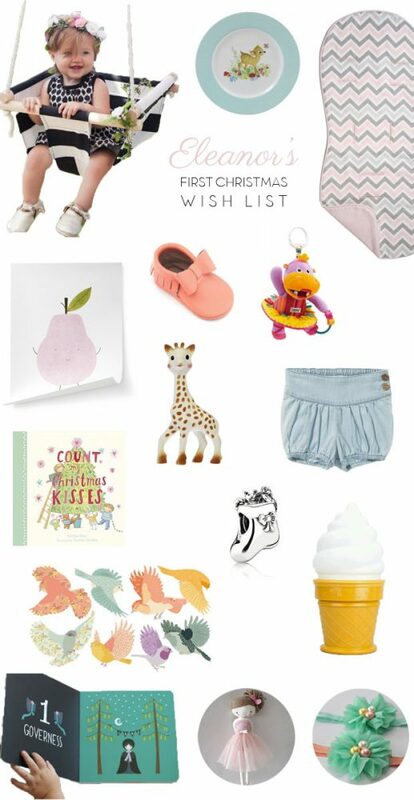 ), headbands, books, a nightlight, pretty crockery for our good little eater, a print for her room and fabric wall decals. She does have a Sophie little teether with handles which is pretty much her number one ‘toy’, so am considering getting her the actual big Sophie version. Pram toys are a bit light on also, so how could I resist this Lamaze hippo for our ‘Hippo’?! I have also commissioned a beautiful handmade doll for her very first Christmas – nawwww! Eleanor was spoiled by her godparents with a gorgeous Pandora charm bracelet for her baptism (and a sweet little bible charm), I’d like to buy her a charm for special occasions, her first Christmas will obviously be one of them with a little stocking charm. All of this of course will be lovingly stuffed into her very own Santa sack (I got this one from Monet + Sox on Down That Little Lane) which I originally thought was too small…but have since decided that small is good. Very good. What’s on your Santa radar? Do you have a little one celebrating their first Christmas? Done any Christmas shopping yet or avoiding the shops like me? Ugh. Anything for a 6+ month old I should be adding? How gorgeous! So glad i stumbled across your blog. That swing is just devine! I love those pretty pink moccs! Such good, practical ideas. Ellie is getting a bag for daycare next year and l small reciting a doll l was given from my Nana. My mum also gives her grandchildren a moneybox for their first Christmas’. My eldest Alex was first. His is a porcelain Peter Rabbit one from England, Nick’s also from England The Hungry Caterpillar. Both their themes as babes. Keep sakes. Alex was only 5 weeks.